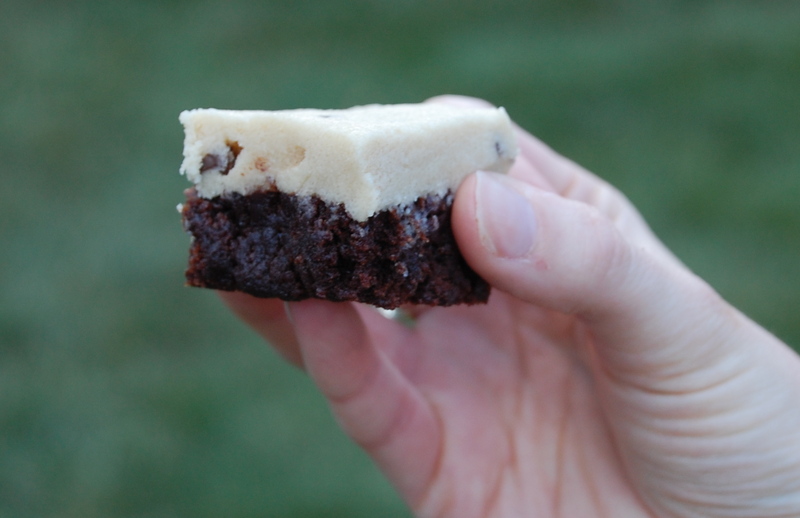 My sister-in-law brought us the most delicious cookie dough brownies last time she visited. They were super rich and incredibly delicious. I decided to try and make them myself and found that they were surprisingly easy. I simply made a 9×13 size pan of brownies and then adjusted the toll house cookie recipe to eliminate the raw egg from the cookie dough. Put them together and you have a cookie dough lovers dream. Make the brownies according to package directions. Set aside and let cool completely. Mix the cookie dough ingredients until well combined. Spread over cooled brownies. Chill in the refrigerator for at least 1 hour. Cut into small squares and watch them disappear! I’m going to be thinking of these all day. Nom! Seriously, you gals make the best desserts. Going to have to try these too! 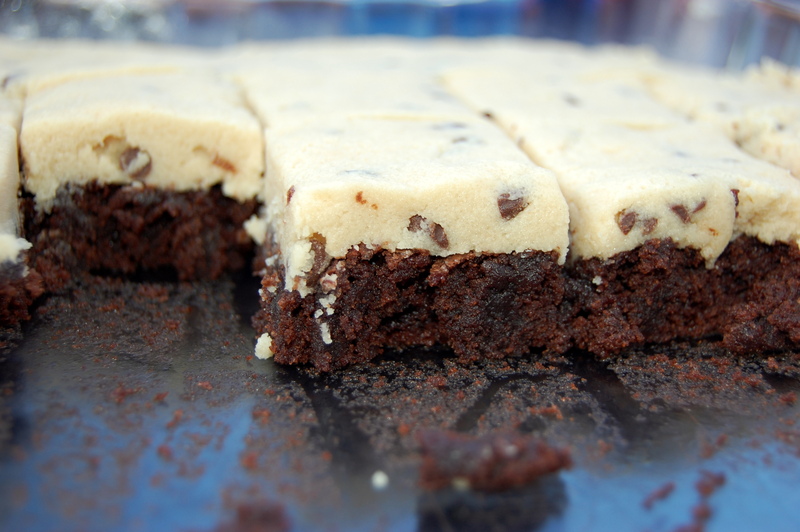 Never had cookie dough brownies. I’ve had cookie dough ice cream. I love it,And i love brownies so much. So will definitely be trying this. 🙂 Looks too good. Thanks for sharing this recipe. Have a good day ladies. I was going to skip over this one, but now that my husband has seen the recipe and requested them twice, there’s no escaping it! And guess who will probably end up eating most of them? Should these then be kept in the fridge? I can’t wait to have an excuse to make these! They will keep better and last longer if you keep them in the fridge. Otherwise the “cookie dough” gets a little dry. Ugh Emily slyly mentioned making these in a conversation to me and now I have to make up. And I definitely will be the one who has to take it for the team. My sweet tooth is hereditary – it can’t be helped.